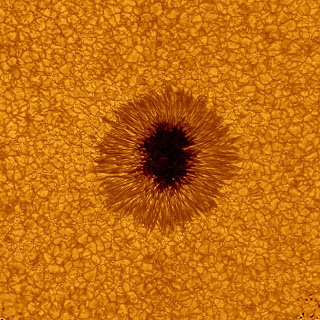 A new telescope at the Big Bear Solar Observatory has captured the most detailed visible light image ever of a sunspot. The 1.6 meter, generically named NST -- for New Solar Telescope -- has remarkably clear seeing thanks to its location on a pristine mountain lake in Southern California, and also benefited from adaptive optics to generate the image. While the image has remarkable resolution of about a 50-mile section of the sun's surface, the technology is a test-bed for an even more ambitious project called the Advanced Technology Solar Telescope, which is expected to be completed in the coming decade. "The new telescope now feeds a high-order adaptive optics system, which in turn feeds the next generation of technologies for measuring magnetic fields and dynamic events using visible and infrared light..."
"The new optical system will allow the researchers to increase the distortion-free field of view to allow for better ways to study these larger and puzzling areas of the Sun. MCAO on the NST will be a pathfinder for the optical system of NSO's 4-meter aperture ATST coming later in the decade. Scientists believe magnetic structures, like sunspots hold an important key to understanding space weather. Space weather, which originates in the Sun, can have dire consequences on Earth's climate and environment. A bad storm can disrupt power grids and communication, destroy satellites and even expose airline pilots, crew and passengers to radiation." What exactly, in laymens' terms, is a sun spot? That's a much more complex question than it might seem, while sunspots have been known about for centuries, we're still trying to figure out just what makes them tick. Our basic understanding of sunspots is pretty solid though. The sun is made of gas and not all of that gas rotates at the same rate; the sun's surface rotates faster at the equator than it does at the poles. These differences in rotation can twist and wrinkle the sun's magnetic field in places until those spots disrupt the heat from rising to the surface, creating a sunspot. These regions have incredibly intense magnetism associated with them and erupt in activity, shooting off material from the sun out into the solar system that can cause everything from satellite and power grid disruptions to the Northern Lights. Another interesting factoid: sunspots only appear dark because of the massive differences in temperature between the surrounding surface and the sunspot itself.